Litigation is roughly defined as any legal dispute between two or more parties that seeks money damages or specific performance rather than criminal sanctions. It encompasses a broad range of disputes including, but not limited to, commercial and contract disputes, real estate and land use disputes, construction disputes, and various other types of cases, including personal injury, landlord/tenant, and products liability. 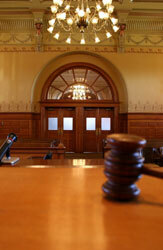 A lawyer's experience and expertise can make all the difference in the success of your case. The litigation team at Carney Thorpe, LLC, has decades of extensive trial experience, representing hundreds of individuals and businesses at hearings, arbitrations, mediations, and trials before local, state and federal courts and administrative agencies. The Carney Thorpe, LLC, litigation team possesses the expertise, negotiation skills and perseverance necessary to act as strong advocates on behalf of our clients. We conceive and execute individual litigation strategies tailored for each particular client that are measured and aggressive, yet still efficient and cost effective. Optimum results and client satisfaction are our ultimate goals.